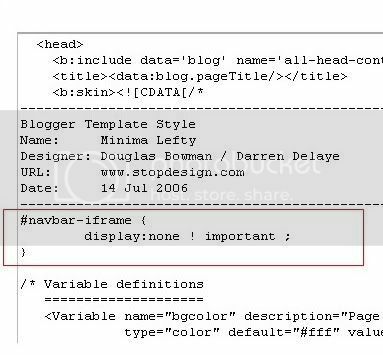 Learn how to hide,disable or remove the blogger navbar(navigation bar) from your blog. Blogger navbar allows users to easily navigate to other random blogs and it also has a feauture to search the blogs ,and mark any blog as spam. So,now you have a clear idea of what really a blogger navbar is.So, why so many people prefer to just remove the navbar inspite of the feautures it has like search,etc.Many people think that, it spoils the look of the blog,especially if your blog has differnet subtitle layout which looks too obvious to see for a visitor.Well, let me come to the actual point on how to disable or hide your blogger navbar. Below is the step-by-step procedure on how to do it with photos to make it easy to understand. 2.Next,click the edit html tab as shown in the below picture. 3.Add the below html code as specified in the below picture. Now, you can see your blog without that navbar(this tip can only hides the navbar,it doesn't completely delete it).If you want the navbar to appear again,just remove that code and save the changes. If you have any doubts,regarding this post,don't hesitate to ask.You can ask your doubts via comments to this post. oh.......great tip. worked 100% for me. It is the great learning. I wish there was a way to learn earlier . thank you so much! :P worked great for my video blog http://angelationgsonblog.blogspot.com/ now readers cant flag my blog.. thank you so much sir! :P worked 100 percent! Thanks Man. It worked like a charm. oh, great !! thank you. THANKS. nothing else was working other than your tutorial. Should we paste the code from the image of the code that you've posted, or should we post the code from the text above the image? thanks!! Hi mate! Any of the above two codes work.No Prob! Thank you so, so, so much! I tried 3 other things like this but your's was the only one that worked for me. I removed the blogger nav bar, but now how do I sign into my blog for new posts & edits?? hi, If you want to Create New Post, Customize,etc.. just Sign into Blogger.com and you'll see that options next to your blog name..
Wow this really works!thank you! I was finding ways all day long, until i searched Google and found this site! Worked for me too here! Hello Kranthi, I donno where to put this, but i wanted to know if there's a way where we can have more than one label elements with different categories listed in them. i.e each label with it's own categories. OH SNAP!! It worked the site looks so much better!!! Now my blog looks so much better! Nice trick, glad to find it here. but is this trick allowed by Blogger? I like those bars because it allows me to skim blogs until I find something that interests me. Is there any way to do that when the nav bar is gone or am I just hosed??? you have a WONDERFUL site! Do you have help with how to add PAGES like Wordpress has? I'd llike to have differendt ones to click on, NOT archives or links... Thanks!!!!!!!!! Good work, and thanks for the opportunity! It's the most helpful tips for new bloggers. Thats Great to remove & make your blog more like website, but as blogger is providing so much to us for free, don't we have to provide some help to them too for their promotion. i couldn't find the code in my html. i have customized my html a lot, but still i haven't touched navbar. i use Minima Template and my email ID is expresstosiva@gmail.com. can you help me out? Thanks for this useful. But I would like about how to hide some part of my post with display the key "read more". Thanks in advance! I have custom templates (Charcoal and Notebook Chaos), but they don't show the Navbar at all. I actually like the Navbar, so can you tell me how to include it!? It is not working for me, as far I know I have followed as you have specified. Plz ignore my previuos post. Now,it is working, when I placed the code just bellow the "variable defination codes block". Anyway it is working now. Looking forward for more tips on blogging. Do you know any way to get rid of the small blogger logo icon next to people's names in the comments? I would love some code for that. Thanks. One question is how do I post thereafter? p/s:for free rapidshare account,come to my blog k.
Thanks for the tips! It works! This is very useful site. ooh jadi gitu caranya !!!! Please visit my blog !!! Please let me know how i can make my blog homepage default to a menu item. i.e. I want the menu page to open by default every time someone visits my blog address. I am using one of your templates. thank you very much. This blog is very useful for newbie like me. wow, good tip, it does kind of ugly up a blog with that bar there. worked perfect for me first try! I didn't find it!!!!! any help????? Great tip, my blog looks a lot better without the bar on top. is that the only instruction or I have to ad the other in the red box? I dont see a similar code in my template code. Thanks for sharing this html code, worked right away. i just started using the communist template and LOVE it - especially sans nav bar but . . . is there code i can use to still allow users to search my blog? thanks! no failure hiding the navbar. thanks for your tip. Great tutorial. Worked like a charm. Thank you! its working dude... but how to logout......? Yeah, it works great! But you can't log out then, can you?